Zelda producer Eiji Aonuma says Nintendo feared a repeat of "negative reactions" to Wind Waker HD. Earlier this year Nintendo revealed that it was in the process of creating an HD remake of The Legend of Zelda: The Wind Waker. The remake, which will release on the Wii U, stirred excitement in the ranks of Nintendo's fanbase, many of whom hold Wind Waker in high regard. That being the case, it's now been revealed that some in Nintendo weren't altogether keen on investing in Wind Waker HD. "When we looked at creating a Zelda for Wii U, there were so many possibilities given the HD graphics. But rather than starting from zero, we actually ran a few tests," said Eiji Aonuma, producer of the Zelda franchise for the last decade. According to Aonuma, Nintendo first experimented with high definition versions of Twilight Princess and Skyward Sword, but wasn't impressed with the results. "Those are semi-realistic representations of the Zelda world so we weren't really surprised with what we got. But with Wind Waker, when we converted that to HD we were really surprised at how great it looked." Despite the clearer improvements presented by the HD test of Wind Waker, many at Nintendo rejected the idea out of hand. "Internally there was actually a lot of pushback," said Aonuma. "People were saying, 'Oh, that Link. People didn't like that Link.' But in talking to our counterparts in the U.S., that wasn't actually the case, people didn't have that negative reaction maybe anymore to that younger Link." Ultimately, this information helped Aonuma sell Wind Waker HD. That said, he's not surprised that his colleagues at Nintendo had apprehensions. While fans appreciate Wind Waker now, at the time of its release it had no lack for detractors who disliked its less "mature" art style. According to Aonuma, it just took time for people to realize the game's artistic value. 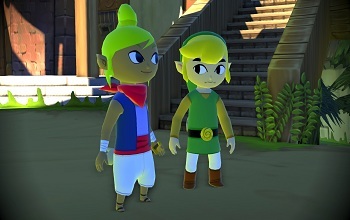 "When we introduced Wind Waker in that graphic style, people resisted it because it was so new, but over time, we may have created this environment that 10 years later is ready to embrace that graphic style."